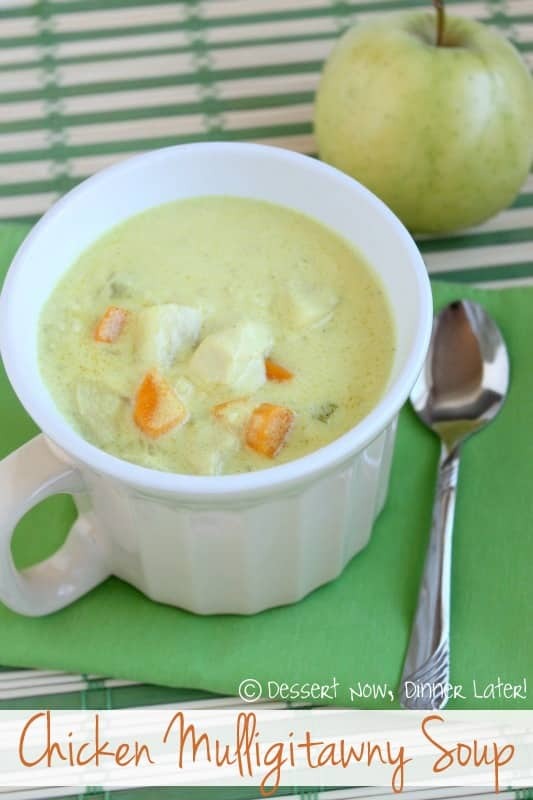 Chicken Mulligitawny Soup - Dessert Now, Dinner Later! 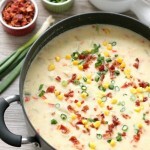 This is an old favorite soup of mine. I first discovered it when I was in high school & I attended the applied technology college twice a week my senior year. I was trying out the Culinary Arts program to see if that’s what I wanted to pursue after I finished high school. The Culinary program there was basically just students running the cafeteria. I was assigned soups for quite a while actually and I was really starting to get sick of making soup. 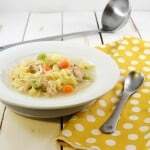 Regardless, I frequented this recipe because the customers liked it & it was easy to make. 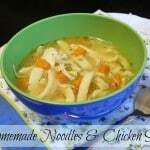 We made ours with egg noodles instead of rice, but I have changed the recipe here for a more traditional Indian inspired chicken, rice & curry soup. 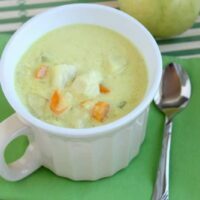 The most unique thing about this soup is that it has chunks of apple in it. 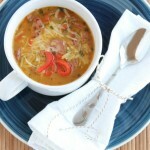 It adds a light sweetness to the soup & it’s quite delicious. My kids gobbled this up as well, which is a miracle in itself. My 2 year old daughter was slurping it out of her bowl like it was a cup of chocolate milk. So this is an incredibly kid-friendly meal! Enjoy! Heat butter in a large stock pot. Saute onion, celery, & carrots for 5 minutes. Add flour & curry powder. Cook 3 more minutes. Next, add the apples, chicken cubes, chicken broth, half & half, rice & sugar. Simmer for 30 minutes. Season to taste with salt & pepper. Serve hot. And it’s kid-friendly? I’ve got to try this! All I will need to change is adding coconut milk instead of half-and-half. Yum! Yum, I love curry soup. I have never heard of this one, but I can’t wait to try it! you won me over with kid friendly! We love soup, especially this time of year! 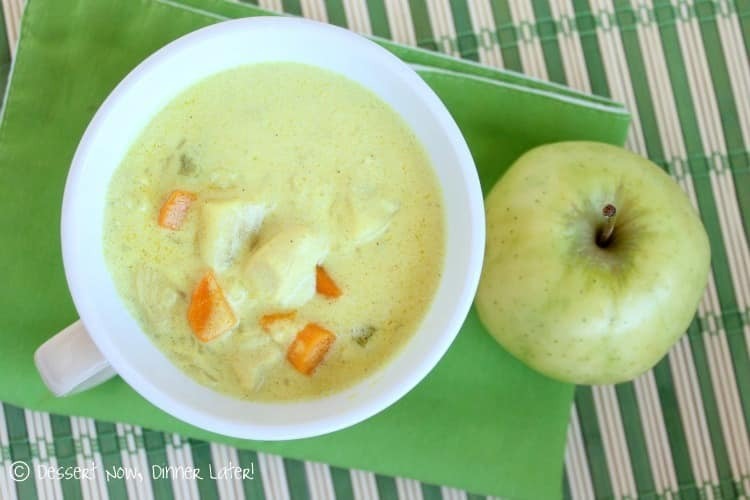 Oooh… Soup just screams Fall! Can’t wait to try it. Ahhh, I want a bowl right now. This sounds delicious! Pinning! This looks heavenly! I’m so happy that soup season is so close. Pinned! This looks delicious! Pinning this to my soup board! Yay! Soup season is coming and I can’t wait! This is a really good one! Thanks for your review! Thanks for sharing this great recipe! I made this tonight and it was delish, our 3 year old gobbled it up!! I tweaked it only slightly based on what I had on hand (2% milk instead of half & half, turkey instead of chicken). That’s so great! I’m glad your family enjoyed it! I really want to make this soon! Sounds amazing. I’m not the best cook. Is the chicken already cooked before simmering or can you put it in raw? Hi Traci! Put it in raw, and it will cook as it simmers for 30 minutes. Sorry for the confusion! I hope you like it!